More and restaurants are turning to their local neighbors for fresh, flavorful foods. Local foods are finding their way to all kinds of different restaurants, from fine dining to casual sandwich shops. Here are ten reasons your restaurant can benefit from buying local foods. According to LocalHarvest.org, the average commute for fruit and vegetables in the United States is 1500 miles. Yikes! For that reason commercially grown fruit and veggies are engineered to withstand travel over long distances. Local foods travel a fraction of that distance and still maintain their appearance, taste and nutrients, without any bioengineering. And good looking food is a good thing, since customers eat with their eyes first. Anyone with a garden can attest to this fact. Just like homemade bread beats the store-bought variety, wholesale vegetables and fruits just don’t compare to local garden goods. As a restaurant owner, it never hurts to support your local economy. You not only keep your money local, but you also foster relationships with other business people in your neighborhood. Never a bad a idea. Add terms like farm-fresh or locally grown to a menu description and watch the items fly out of the kitchen. I’ve never heard a customer complain about eating food from local farms or gardens. Using local foods can be a major selling point for restaurants. Because local foods are based on the seasons, restaurants need to rotate their menu items, based on availability. And that can be a good thing. What better way to come up with daily specials, than looking at the ingredients at the local farmers market? While few small farms can compete with wholesale food distributors for steep discounts, their prices aren’t always that much higher. And when you take into consideration the higher quality of local produce, you are really getting more bang for your restaurant food cost buck. 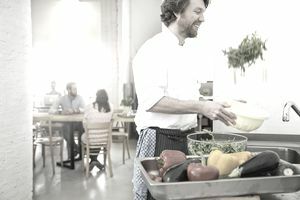 Some areas offer Restaurant Supported Agriculture (RSAs) which are similar to a CSA (community supported agriculture) offering buying discounts and other tangible benefits for restaurants. Long after the growing season is finished you can still find plenty of local foods to add to your restaurant menu. Poultry, beef, and pork are available year round, as is honey and dairy products. Even baked goods, like breads and desserts, can be showcased as local foods. Small farms, once a trademark of the United States, are a dying breed. Too many farmers are forced out of farming and their fields are chopped up into housing subdivisions or strip malls. Supporting local farmers helps keep them in business, which in turns keeps the countryside intact, preventing your town from becoming Anytown, USA. Small farms offer unique produce that is often unsuited for commercial food growing. Restaurants can choose from hundreds of heirloom varieties of fruits and vegetables, adding more flavors and colors to their restaurant menu.